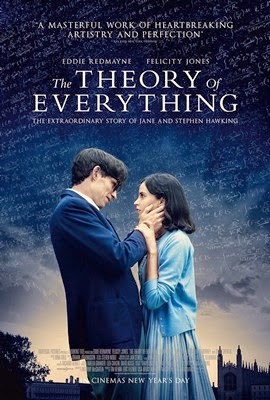 The year is off to an excellent start film wise with the release of "The Theory of Everything", a film exploring the relationship between renowned physicist, Stephen Hawking and his first wife Jane. The film opens with Stephen and Jane meeting at a party during their time at Cambridge university. Eddie Redmayne and Felicity Jones are ideally cast as the young lovers and the portrayal of their courtship is tender and romantic. It's impossible not to get swept up with them under the starlit sky at the May ball as they sip champagne and fall in love. However, once Stephen is diagnosed with motor-neuron disease and given only two years to live, the story shifts. We see the measure of Jane's love when she decides to marry him and support him through his illness. As his health deteriorates, while his success increases, she finds it more and more difficult to cope bringing up a family and keeping a home, and it is clear that she is under a great deal of strain. Jones excels at bringing her character's feelings to light with sharp tone of voice and pleas to Stephen. As an audience we have a real sense of someone in crisis, increasingly unable to cope, unhappy with her husband, but incredibly loyal. For his part, Redmayne is extraordinary as Hawking and we are rewarded with one of those rare moments in cinema where we forget we're watching an actor and become convinced we're watching the real man. I think the script is good, though undeniably the story has been romanticised for the cinema. A little digging reveals there is more to the story of Stephen and Jane, including several years where they were estranged. Indeed, the memoir upon which the film is based is a revised version of a more critical book released by Jane prior to their rekindled friendship. Having said that, it is a film which is tender, has moments of humour, and is incredibly moving. I greatly enjoyed it and I hope it sees success during awards season.